Russia Economy Watch: Is Russia Just Another Emerging Economy, Or Is There Something Special About The Present Bout Of Financial Turmoil? Is Russia Just Another Emerging Economy, Or Is There Something Special About The Present Bout Of Financial Turmoil? Russia's President Dmitry Medvedev today pledged $20 billion in financial support for the Russian stock market and cut oil taxes in an attempt to bring a halt to what has now become Russia's worst financial crisis in a decade. Medvedev took this action in order to try to lay the basis for a reopening of Russia's bourses tomorrow, following three days of irregular operation on the back of a 25% drop in the Micex Index. 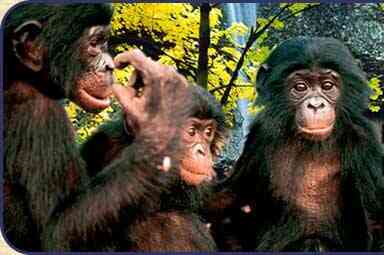 After the announcement Russian shares which are traded in London surged and the interbank lending rate plunged. The decision followed a meeting between Medvedev, the central bank Chairman Sergey Ignatiev and Russia's Finance Minister Alexei Kudrin. Ignatiev also announced that central bank reserve requirements for Russia's banks would be eased in an attempt to provide more liquidity. The tax cut for oil exports will come into effect on Oct. 1 and save producers and refiners $5.5 billion, Kudrin said. OAO Rosneft, the country's biggest oil company, climbed 23 percent to $5.76 in London trading at 3:40 p.m., while smaller rival OAO Lukoil advanced 8 percent to $56.20. Moscow's stock exchanges will open tomorrow after being halted by the market regulator. The central bank cut reserve requirements for banks by 4 percentage points with effect from today, and this should free up an estimated 300 billion rubles. The move is in addition to a Finance Ministry decision yesterday to make $60 billion of funds available to banks, including a three month injection of $44 billion into Russia's three largest banks - OAO Sberbank, OAO Gazprombank, and VTB Group. VTB, the only one of the three that trades in London, had jumped 15 percent to $3.40 by late afternoon trading. Russian sovereign bonds also dropped to the lowest in four years today, with the yield on the government's 30-year dollar bonds 32 basis points higher this afternoon at 7.3 percent at 1:23 p.m. in Moscow. The cost to of protecting this debt against default jumped 17 basis points to 300, the highest since May 2004, according to BNP Paribas prices for credit-default swaps. The present crisis seems to have been sparked by an almost random event - the default of brokerage firm Kit Finance on a number of repurchase agreements. This rather small scale incident, of limited importance in and of itself - seems to have produced something approaching panic which extended right across Russia's financial markets. Evidently investors had been become increasingly nervous about holding Russian assets given ongoing concerns and the scale of the global financial turmoil. In fact Russia seems to be facing something of a "trifecta" at the moment, with the normal nervousness about holding riskier emerging market assets being reinforced by concerns about the vulnerability of the Russia economy in the face of falling oil prices and issues provoked by Moscow's recent decision to "go it alone" in recognising Georgia's two separatist regions. All these factors have coalesced to produce what is being described as "an especially toxic cocktail" whose effects - and despite Russia's substantial oil fund safety net, and the very large quantity of foreign exchange reserves parked at the central bank - seem to be proving very hard for the Russian financial system to simply brush aside. The real point I would like to stress right however, is that while Russia's financial markets are currently taking a pounding for relatively fortuitous reasons, the underlying macroeconomic issues were always going to raise their head, as I have tried to spell out in my two extensive recent reviews of the Russian economy, Russian Inflation, Too Much Money Chasing Too Few People? 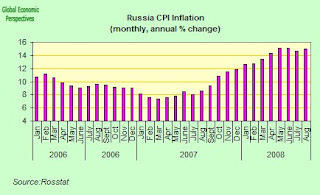 and Russia's Consumption-Driven Inflation: Will It All End In Tears?. 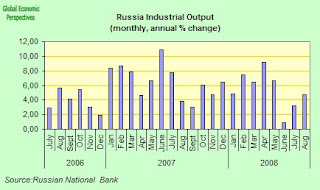 Basically Russia is suffering from some sort of modern variant of "Dutch disease", whereby the revenue generated by the sharp oil boom has accelerated the rest of the economy way beyond its short term capacity level (especially given the underlying demographic issues Russia faces) and this has simply produced a very pronounced spike in short term inflation, coupled with deteriorating competitiveness in Russia's domestic industrial sector. 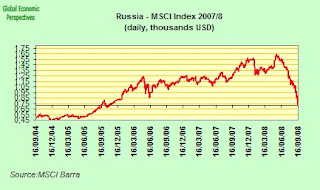 So even though it is obvious that we are not about to witness a financial meltdown - or anything approaching it - in Russia at the present time, what has happened over the last week is an early warning sign. Things are not all for the best in the best of all possible worlds here, and even if a resurgence in oil prices during 2009 will once more paper over the multitude of seismic cracks which are emerging, the deep and endemic problems will in fact only worsen if what we are treated to from the Russian administration is simply more and more of the same on the policy front. In many ways the achilles heel in Russia's current development process is not to be found in the financial system - $550 billion or so in foreign exchange reserves and another $160 billion in the SWF should certainly serve to protect the economy from all but the most severe of shocks - rather the achilles heel is Russia's nascent industrial sector, which is being steadily choked into quiesence by a combination of high domestic inflation and long term labour shortages produced by Russia's rather special demographic profile. Indeed Russian industrial production expanded at a slower pace than most observers were hoping for yet one more time in August, according this week's data from the Federal Statistics Service. Industrial output was up 4.7 percent, compared with 3.2 percent in July and 0.9 percent in June. And even the apparent acceleration over July is really only a mirage based on base-effect variations from 2007, since output actually fell 0.9 percent on the month, as foreseen in the VTB Manufacuring PMI survey. I think it is important to bear in mind here that Russia's economy actually grew at an annual 7.5% in the second quarter, while manufacturing growth was nearer 5%. Which means that in a "newly industrialising country" the weight of industry in the economy is declining. This is obviously unsustainable - and doubly so given what we are now seeing about the flaws to be found in the financial-services construction-activity driven model which some had seen as an alternative to industry - since however resource rich Russia maybe, you cannot live from oil alone, especially when your oil output has a ceiling. Basically the more living standards in Russia rise, the less important oil will become as a percentage of GDP, and the more dependent the Russian economy will become on other sectors. This is why the current consumer price and wage inflation levels are no mere trifle. Obviously it has been of some considerable importance for the country's future that the Russian authorities get a grip on the inflation problem, and this is just what the central bank has clearly failed to do, with the annual rate rising again to 15 percent in August - up from 14.7 percent in July. So one component in the present financial crisis is clearly a crisis of confidence in the quality of Russia's institutions and in their capacity to handle the very complex problems which present themselves in modern macroeconomic management. With the central banks benchmark interest rate currently standing at 11%, and inflation at 15%, Russia has negative interest rates of 4% which obviously make it very easy to fuel a lending driven consumer and construction boom, but very much more difficult to communicate to observers that you actually know what you are doing. So while all that foreign exchange reserves muscle that the central bank can put to work in the short term to stamp out the present bonfire will in all probability bring a halt to the present panic, they are clearly not able to prevent the outbreak of the fires in the first place, and we should, therefore, expect more of the same at some point. To make a comparison, Brazil's central bank currently has interest rates at 13.75% while inflation is running at just over 6% (ie Brazil has 7.5% positive interest rates), and the bank is currently justifiably earning for itself a reputation as Latin America's new Bundesbank, an expression I doubt it would ever ocur to anyone to use in reference to Bank Rossii . And the comparison I am making with Brazil is no idle one, since Brazil is, of course, also an oil-and-resource rich emerging economy. So it is clear that Russia has special problems, problems which (despite the similarities) set what is happening in Russia rather apart from what is currently happening in a lot of other emerging market economies. Both Russia's MICEX and RTS exchanges remained effectively closed first thing this morning (Thursday) following trading being suspended again yesterday - they were in fact open for less than two hours on Wednseday morning - with closure being effected in order to prevent a further sell-off on top Monday's record-breaking falls. The ruble-denominated Micex Stock Exchange did resume some very limited trading at 11:00, but only limited operations were authorised - the decision being effectively to allow participants to close repurchase deals still outstanding from Sept. 16 and Sept. 17. Russian stocks have now plunged around 60 percent since their May peak, and while the Micex did initially gain 7.6 percent in initial trading yesterday, these gains were very rapidly erased and then turned negative, as the index plunged as much as 10 percent before a halt was called. Russia's dollar-denominated RTS index stood at 1,058 points when trading was halted, nearly 58 percent down from its peak of 2,498 points reached in May. In part Russia's problems only reflect more general "risk aversion" issues which are facing all emerging market economies. Emerging-market stocks have fallen the most in 11 years this week, and their currencies have been falling, and the cost of insuring emerging market bonds have been rocketing as rising interest rates and tumbling commodities have prompted investors to sell riskier assets. 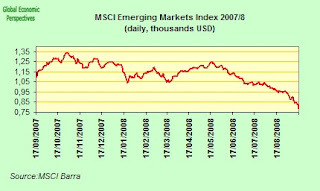 Every emerging stock market in the MSCI indexes has been retreating this month, and the MSCI Emerging Markets Index fell 2 percent yesterday to 768.92 a time, its lowest level since October 2006. The index is now down 19.59% since the start of the month, and 29.27% over the past 3 months. Basically, as we can see in the chart below, the trend has been down since May. 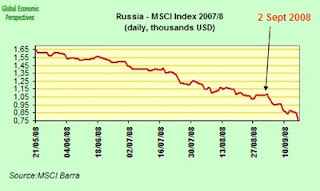 The Russian MSCI index, in comparison, is down 36.1% on the month, and 54.2% over the past three months. That is, the fall in Russia has been much steeper, and certainly predated the August "events" in Georgia, which have only served to accelerate a process which was already ongoing. 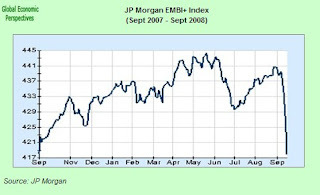 Of course, to put things in a bit better perspective, the recent fall follows several years of rising stock values, and thus the current stock "correction" is to some extent a cyclical one, as can be seen from the 4 year MSCI index chart (below). In the forefront of the fall in Russia share prices have been energy stocks, including Russian oil producers like OAO Gazprom and OAO Rosneft, who have declined substantially following the sharp drop in crude prices. Gazprom, the world's biggest natural-gas producer, lost 18 percent to 158.41 rubles in the latest turmoil, while Rosneft, Russia's largest oil company, sank 22 percent to 132.20 rubbles. Oil prices were down again this morning, after bouncing back somewhat yesterday. Light, sweet crude for October delivery fell 97 cents to $96.19 a barrel in electronic trading on the New York Mercantile Exchange midafternoon in Singapore. 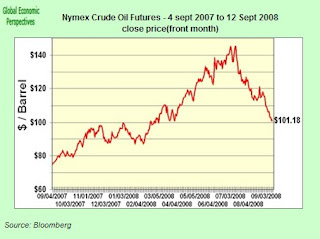 The financial turmoil of recent days has lead to some volatility in oil prices, and the price did sneak briefly back above the $100 mark at one point, but the trend is decidedly down, and crude has now fallen more than $50 — or over 35 percent — from its all-time trading record of $147.27 reached July 11. Urals crude prices are slightly lower than the light sweet prices quoted above, and peaked at $140.80 a barrel on July 3. Since that time they have fallen about 36 percent and today were at $90.01. Evidently the Russian economy is in no imminent danger of short term default, and foreign exchange reserves, which stood at $560.3 billion on September 12 (according to data from the Russian central bank) - the third largest globally, after China and Japan - are evidently ample to handle any forseeable crisis. In addition Russia has a $163 billion SWF (the National Welfare Fund), which is split into two parts, $130 billion in a reserve fund, and $33 billion in the National Wealth Fund (the SWF proper). The reserve fund especially can be used to support any additional government fiscal spending which may be produced by the need to inject cash into the banks and the equity markets. 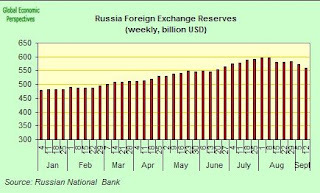 Nonetheless - as can be seen in the above chart - Russia's reserves have been dropping quite sharply since early August, and are now down some $37 billion since their August 8 peak. Reserves declined by $13.3 billion to $560.30 billion in the week ended Sept. 12 alone, after falling $8.9 billion in the previous week. About 47 percent of Russia's reserves are held in U.S. dollars, 42 percent in euros, 10 percent in GB pounds and 1 percent in yen, according to the most recent figures released by the central bank (June 30, 2007). Part of the recent reduction in reserves has been the result of central bank intervention in support of the ruble, since Russia operates a policy of trying to maintain the currency steady within a trading band set against a basket of euros and dollars. Evgeniy Nadorhsin, a senior economist at Trust Investment Bank in Moscow, estimates that the central bank sold approximately $3 billion in fx reserves last week. This is very hard to say. Clearly we should expect the economy to slow substantially in the last quarter of 2008 and the first quarter of 2009, as credit conditions tighten for households, and the decline in oil prices restricts revenue flows to the corporate sector. As just one indication of the worsening credit conditions we could note that Russian 5-year credit default swaps are trading with a spread of around 253-255 basis points, little changed this week but more than double the level seen before the start of the conflict with Georgia. On the other hand Russia is hardly the Baltics, so we should not expect the economy to go into a nosedive. A lot depends on the view you take about the future of energy prices. Since my own view is that the global economy will slow considerably - in addition to the reduction in growth rates alreadty seen so far this year -in the aftermath of the most recent bout of financial turmoil, and this will serve top bring oil prices down even further, but we should reach a floor at some point, at around $80 perhaps. More importantly when it comes to the future of oil prices, I am not expecting any kind of long and deep global recession. Many of those developed economies who are significantly affected by the bursting of their construction booms (and the banking issues which have gone with it) will probably have weak domestic consumer demand for some time, but a solid core of emerging economies may well take off again quite rapidly as we move into 2009, and these should give significant impetus to the global economy as a whole and especially to export dependent economies like Germany and Japan (who by and large are not reeling under the impact of the construction bust), but who are noting the slowdown in their key emerging markets. As we can see in the JP Morgan EMBI+ index (see below), emerging economy bonds have taken one hell of a battering in September. Looked at the other way round, the extra yield investors demand to own developing nations' bonds instead of U.S. Treasuries has been rapidly going up, and today rose an additional 2 basis points to reach 4.24 percentage points, the widest spread since September 2004, according to the EMBI+ index data. So EM bonds have been taking a battering but they have taken a battering because of nervousness about the implications of a financial crisis in the developed economies, rather that as the result of any inherent problems in their own ones. That is what sets this crisis apart from the 1998 one, and that is what means that the financial markets in these economies will in all probablilty bounce back again quite substantially once all the nervousness dies down. Basically most of these markets are neither "oversold" nor are they "maxed out". Au contraire, the prices of their bonds and equities may well soon start to look pretty attractive as the nervousness passes. 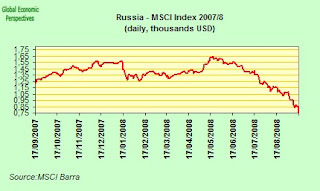 What is interesting about the EMBI+ chart (see above) is the way in which things seem to have really taken a decisive turn for the worst in late August, and it is curious to note on the chart below that the Russian MSCI index also started to deteriorate further starting on or around 2 September (see chart below which is from May 2008 to date). So while the Georgia factor may have made people nervous, other, deeper, structural factors are obviously at work. And while I am on deep structural factors, and the MSCI Emerging Markets index, I would like to conclude by pointing out that the decline since mid May has been pretty generalised, and in some sense the process involved is obviously a cyclical one. But this fall will at some point hit bottom, after which time we should be ready to see a rebound, as investors move in and snap up what will obviously be seen as very attractive buying opportunities. So while some key developed economies seem to be clearly heading for an extended period of pretty sub-par growth, a number of emerging ones may well be gearing up again for another bout of ongoing super-par expansion. As for the structural problems (i.e., the demographic and industrial capacity issues), what is the Russian government's ideal response? Assuming there will be no rapid turnaround demographically, do they need to focus on raising productivity levels? And if so, what is the best route - state investment, foreign investment? "what is the Russian government's ideal response? Assuming there will be no rapid turnaround"
"do they need to focus on raising productivity levels?" Clearly this is important. The world bank noted in their study that up to 2006 a lot of the increase in living standards and wages was accompanied by improvments in productivity, as resources were moved from less productive to more productive sectors. It has only been in 2007 and 2008 that wage rises have exploded to far outstrip any meaningful contribution from productivity, and this of course is the overheating component. 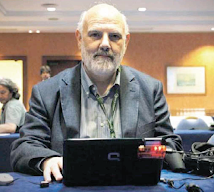 Productivity is a lovely word to use, but you have to imagine that virtually every government on the planet is trying to focus on getting more of it, but few of them are being that successful, so it isn't that easy, and it isn't a miracle cure all. Russia needs MASSIVE institutional reform. You simply can't run a modern complex economy the way they are trying to run Russia without having problems, as we are now seeing. Having a serious anti inflation policy would be a first step I think. This means higher interest rates and larger fiscal surpluses in the short term. As I say, Russia could try taking a look at some of the things they have been doing in Brazil, and copy them. In the longer run they need to address the demographic issue, although again this is going to be hard, since we now have a lot of very low fertility societies, but have very few examples of successful responses in recent times. Of course France and Sweden noticed the problem in the 1930s, responded, and now have a lot smaller problem than most. But, this is very long term. Short term a much more positive environment for non ethnic Russians who want to come and live in Russia would be a start.